The Khmer people group of Cambodia number over 14 million people and are ranked 36th on Joshua Project’s list of the 100 largest unreached people groups. They comprise nearly 90% of Cambodia’s population, mostly filling the central and western parts of the nation. Most Khmer people are rural rice farmers or fishermen (49%) though more are working in the growing tourism, garment, and construction industries. 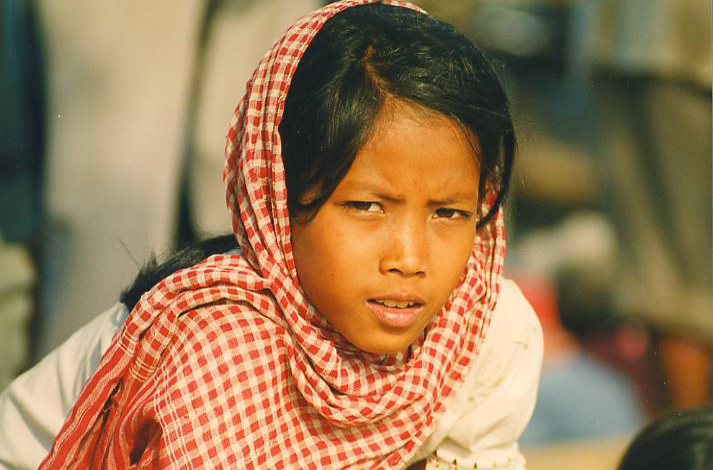 Khmer people wear a garment known as a krama made of red or blue gingham fabric which can be used as a scarf, bandana, hammock for children and even as a weapon. Khmer households are based on the nuclear family though they may include other close relatives. The Khmer people speak Khmer which is the official language of Cambodia. Among the Southeast Asian languages, they have the oldest written records which date back to the seventh century and show a link to Indian writing systems. The link with India is not just apparent in their writing system but also their religious practices. The former Khmer empire (9th-13th centuries) adopted both Hinduism and Buddhism from India though today the Khmer people have dropped Hinduism and are approximately 90% Buddhists. Their Buddhist practices intermingle with various animistic practices which differ from region to region. Between the years of 1969-1979 the US/Vietnam war, a Cambodian civil war followed by the iron rule of Pol Pot and his Khmer Rouge decimated the country and people of Cambodia. The Khmer Rouge, in an attempt to eradicate all outside influence, murdered Buddhists and Christians alike as well as those with western educations and all who opposed them. Ultimately, it is estimated that 20-40% of the Cambodian population was eradicated during that time. Thousands more fled as refugees into refugee camps and surrounding countries. Finally, in 1979, Vietnam ousted the Khmer Rouge. Since that time, religious practices have been reinstated, and Christian converts have returned to Cambodia from foreign countries and the refugee camps creating an avenue for the gospel to flow through. The task is very great, however, to reach the 13.75 million Khmer in Cambodia who are not believers. This war-torn people needs the Prince of Peace.